The Abbott government must break Australia’s “provincial reflex” in foreign policy. To an audience of the world’s most powerful leaders last month, Australian Prime Minister Tony Abbott began the G20 Summit with an odd speech. His opening remarks listed his domestic problems and how he had found it “extremely difficult” to pass the budget. It was an injection of provincial politics that gave further credence to an ongoing discussion in Australia on the maturity of the country’s foreign policy. The Lowy Institute, a Sydney-based think tank, has been running a debate centered on Peter Hartcher’s paper, The Adolescent Country. The paper argues that Australia’s foreign policy is driven by a “provincial reflex” and is “derivative” in nature. As Sam Roggeveen notes in the debate, “conformity is an important part of the Australian character,” conceding however that it may at times be “beneficial.” Both agree that Australia must overcome its passive, bystander-by-default stance if it is to benefit in the Asian century. Yet it is Australia’s role in the Asian century that remains the issue – is Australia a conforming ally riding on the coattails of bigger Anglosphere powers or is it an agile and independent Asian middle-power? The Abbott government, in its first year, was intent on bringing in some big changes. His government took the result of a big election win to mean it had the mandate to do just that. Amongst the changes, Abbott declared that “coal is good for humanity” and tore up the carbon tax. Out too was a poorly implemented mining tax, and in came harsh asylum seeker policies (since condemned by the UN), and, despite breaking with election promises, his government announced further cuts to public broadcasting, education and health. Abbott even reinstated the old custom of awarding knighthoods. Perhaps not surprisingly, Abbott’s domestic policies haven’t been wildly popular. Approval polls last week saw the prime minister and his party slump to 2014 lows. Amid these much-debated domestic issues this year was the signing of three new free trade agreements (FTA) with Japan, South Korea, and (the big one) China. 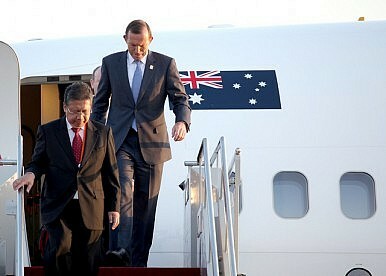 Announced last month, the deal with China puts Australia squarely in the orbit of “the big guy” in Asia. Yet its limited benefit has policy wonks and commentators questioning both the FTA’s rationale, and the government’s foreign policy credentials. Early analysis and modeling suggested that an Australia-China FTA would provide only a marginal increase to GDP for Australia, an estimated 0.039 percent per year. Indeed, the economic rationale of the FTA is flimsy (as explained here) and instead the deal is being looked at as a significant strategic instrument, the balance of which doesn’t seem to weight in Canberra’s favor. Along with the FTA at the G20 came an odd speech from Abbott in which he seemed to endorse respect for China’s core interests, and by extension “respect” for Beijing’s claims in the South China Sea. He noted that on listening to Xi’s speech “some of the shadows over our region and over our world lifted and the sun did indeed shine brightly.” Abbott suggested that the sun would continue to shine if “we respect each other’s core interests and major concerns.” This may prove problematic in numerous ways, but ultimately draws Australia deeper into Asian disputes. For one, respecting China’s core interests in the South China Sea means disrespecting Japan’s claims, and vice-versa. If there is any semblance of this zero-sum logic in the cabinet, this is worrying – it will cause problems if it persists into 2015. Indeed, rather than picking sides the government must prove that it is capable of negotiating a nuanced foreign policy that balances new economic interests with China, Japan and South Korea, as well as those competing strategic interests. It will likely prove a formidable task. As such, what are being touted as the Abbott government’s biggest foreign policy wins in 2014, the FTAs, may be more problematic than they seem at first glance. What is concerning about this is that they themselves don’t appear to fit into a stated grand strategy of any sort. On winning office, the Abbott government shelved the 2012 Asian Century White paper. There’s no replacement paper (the last foreign policy white paper was in 2003) that offers clear policy pathways on how economic and security interests should be approached or towards what ends. A case on why Australia needs such a paper is here, but aside from providing Australia’s diplomats with a toolkit it offers whole-of-government, not to mention Australian businesses operating abroad, a coherence of purpose. Such a document doesn’t have to be rigid and prescriptive but rather should be global, informative and directional. While pragmatism and domestic awareness should be present in all government policy, it should not inhibit innovation and foresight. Australia needs to attain this vision and move away from its provincial reflex. A stronger, smarter Australia is better for everyone. In the throes of a major geo-political shift, Asia needs strong independent middle-powers. Elliot Brennan is a Research Fellow and Editor at the Institute for Security and Development Policy, Stockholm, Sweden and a Non-Resident at the Center for Strategic and International Studies, Honolulu, USA.